NOTICE: Activation key must be used on a valid Steam account. Requires internet connection.ABOUT THE GAMEShadows: Heretic Kingdoms is the next chapter of the Heretic Kingdoms saga. Set a few years after the events of Kult: Heretic Kingdoms, players are caught up in a terrible conspiracy and propelled upon an epic journey through a world of dark fantasy. The Devourer. A creature that wanders betwee… n the worlds, a creature of shadows,a creature that feeds off the souls of fallen enemies. The world is poised on the razor's edge, demons have ravaged the lands, overrunning it almost overnight. The Devourer is the only hope that remains. Yet, will he enslave the world and rule as its evil lord, or will he save it from the threatening darkness Only his inner conflict, fed by the voices of the devoured souls, will reveal the fate of the world. KEY FEATURESTwo game worlds in one: Wander between the worlds and risk a glimpse into the dark shadow world, where you will also face enemies and solve mystic puzzles.One dark hero, 15 different characters: Devour the souls of your enemies and use a lot of different characters and combat styles.Struggle with yourself: Learn from the devoured souls, let them advise you and develop your character.Destroy nightmarish creatures: Face the most terrifying creatures that you could ever imagine.Take charge of your fate: A lot of your decisions affect the game - and thus the way the story develops.Innovative story telling and unique party system: With this combination, Shadows stands out of the crowd, and has already been awarded most promising product at the Role Play Convention 2014 in Cologne. SYSTEM REQUIREMENTS Minimum:OS: Windows XPProcessor: x86 processor, 2 GHzMemory: 4 GB RAMGraphics: nVidiaGeForce 260GTX or higherHard Drive: 5 GB available spaceRecommended: OS: Windows 7 / Windows 8Processor: x86 processor, 3 GHz +, quad coreMemory: 4 GB RAMGraphics: nVidia GeForce 560GTX or higherHard Drive: 5 GB available space © bitComposer Games, 2014. bitComposer Games is a brand of bitComposer Entertainment AG. Developed by Games Farm. Heretic Kingdoms, Games Farm, Games Farm logo are trademarks or registered trademarks of Games Farm, s.r.o. in EU, US and/or other countries. 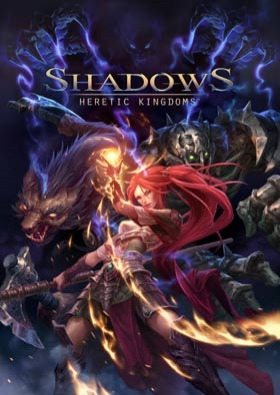 Shadows: Heretic Kingdoms and Shadows: Heretic Kingdoms logo are trademarks or registered trademarks of bitComposer Entertainment AG and Games Farm, s.r.o.. All other trademarks are the property of their respective owners and used under license. All rights reserved.